The Fanatic Carbon 80 Adjustable paddle is almost the best option if you are looking for an adjustable carbon paddle. A contrasted paddle that has shown its qualities and we can assure that it will fulfill your expectations. 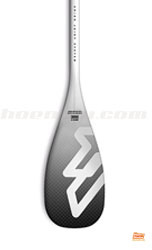 The Fanatic Carbon 80 Adjustable paddle offers an excellent quality at a reasonable price in the case of a top paddle. It is a great option for those looking for a top-level paddling in terms of performance and weight, which can be used both for surfing and paddling long distances, where paddle length have to be different to get the most out of each session. The Carbon 80 is an almost full carbon paddle that will surprise you with its performance and its finish. 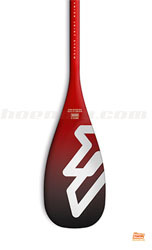 Fanatic includes the Union Joint System, which is the system used by the brand to join the part of the blade with the shaft, which is higher than normal, preventing this connection from being in one of the critical points of paddling. In addition Fanatic uses the anti-twist system in this adjustable version to ensure that the knob does not move from its position when we give maximum strength in the paddling. Available in two sizes, 6.75" or 7.25", we are really convinced that with the Fanatic Carbon 80 you will be successful in choosing your new paddle. Made in 80% carbon, with ABS reinforcement on the edge of the blade and kevlar on the shaft, this paddle is one of the best ratio price/quality that you can find on the market.